There’s something special about the hospitality found at Denver International Airport. It has a lot to do with the airport’s Ambassador Volunteers. From the moment travelers step off a plane or walk into Jeppesen Terminal, there’s a friendly and efficient team looking out for them. If passengers need directions, Ambassadors will point the way. If guests need assistance, these airport volunteers will lend a hand. Whether directing passengers to a connecting flight, helping to reunite long-lost friends, or capturing a group photo, there is no task the Ambassadors won’t take on. 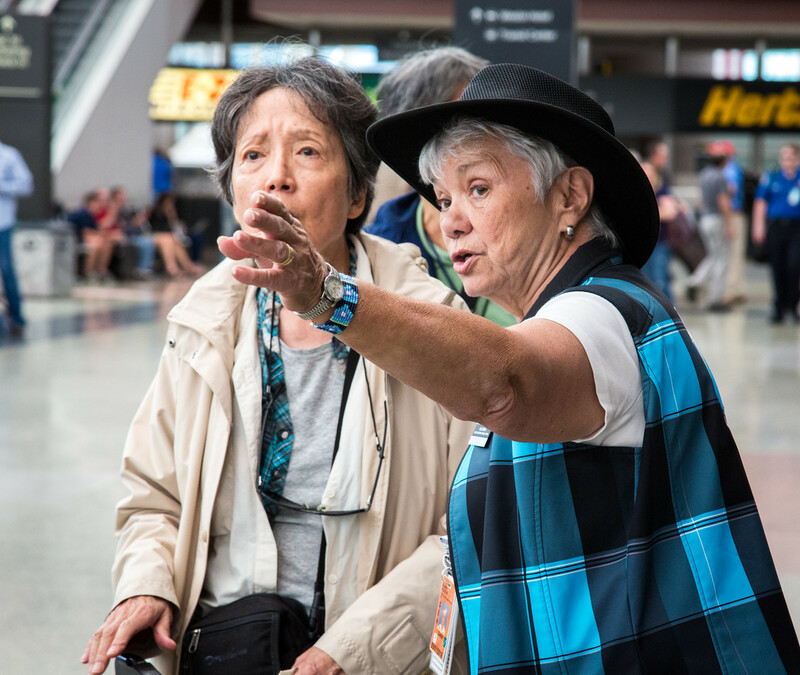 By volunteering your time as an Ambassador at Denver International Airport you will gain the personal satisfaction of providing a helping hand. Moreover, you’ll receive the gratitude of the thousands of visitors you help and the appreciation of the entire airport community! The Ambassador Volunteer Program has been recognized internationally for its excellence and innovation. One reason for this is our determination to continuously look for process improvements that benefit our passengers. Prospective Ambassador Volunteers should have strong communication skills, excellent customer service standards, and be able to complete a four hour shift. Ambassadors commit to volunteering a minimum of 36 hours each quarter, for at least one year. Benefits include complimentary employee parking, significant concession discounts, uniform, quarterly meetings and tours. For additional information, contact the Ambassador Volunteer Program office at (303) 342-2255.